Before marketing a product, we ought to be sure that the chosen niche has a market i.e. it has a consumer demand and for purposes like this, the Sticker marketing proves out to be the very tool. Stickers are handy and present all around us- on your home appliances mostly. People all around the globe happen to share love for stickers-well not exactly stickers but for all the free stuff that they can easily use for multiple purposes at home and at school. Instead of taking you head up to get some printed material, you must know that people do actually use sicker for purposes like decoration etc but the printed materials and flyers just result in addition to the bin. Another factor adding to the preference of Custom Stickers for marketing campaigns is the easy availability and distribution of Stickers. People (even strangers) readily accept a sticker, so another useful tactic could be the distribution of these durable and colorful stickers in Parks, Malls etc. where the favorable crowd is sure to be found. For this you could probably bring out a couple of friends or colleges and ask them to hand out the Stickers in their allotted places. You can be highly creative with the stickers; you can put up funny jokes or one-liners and handout amongst the younger generation. This will draw even more people to come to you for stickers instead of it being just the other way around. Promotion is a very important thing to keep in mind so in order to create an alert about your upcoming service; you can put your stickers in Sales letters, and all other kinds of promotions that you use. As you all must be aware, stickers aren’t made of gold but of paper, plastic and of course the adhesive for the sticky part. The production of around 1000 stickers wouldn’t cost you more than 300$ whilst a TV advertisement would just be starting at $750. If you are willing to go over another 100$ expense of the stickers, you can choose to get the stickers made out of fabrics too. If you choose to go with Sticker marketing campaigns, you are likely to experience a lot lesser competition than you would face in the advertisements. Slogans would easily create a positive and reliable image of your company, which brings you most of the target audience. 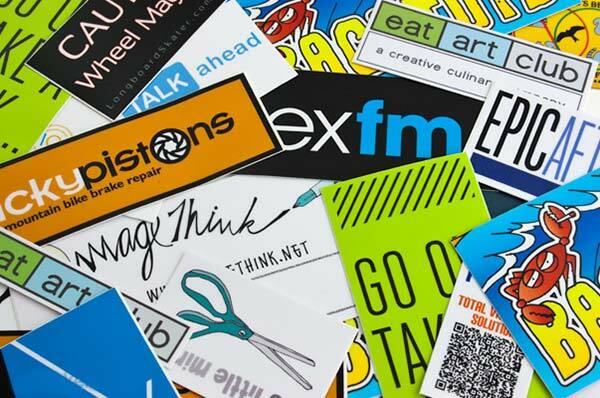 Stickers, as an approach to marketing are not accepted by most of the companies and this gives you a clear and direct way to interact with people and cut down the competition.